The No. 63 Corvette in the chicane at Le Mans, leading a Ferarri. 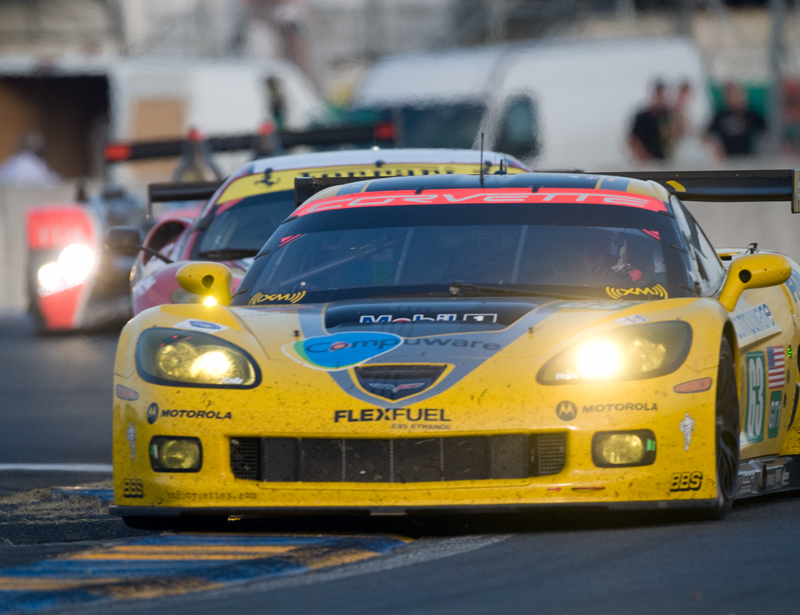 FLOWERY BRANCH, Ga -- Johnny O'Connell and the Corvette team closed out an era of Corvette racing with a victory in the GT1 class at Le Mans and have dominated the field in GT2 in the ALMS. With the win O'Connell became the only four-time American to win at Le Mans. However the team is moving on to a new challenge as they take the vaunted 'Vette from the GT1 class to the highly competitive GT2 class where the Porsche's, Ferarris, and BMWs have been winners for decades. We caught up with Johnny between races and here is is what he had to say about Le Mans and the future of the Corvette in the GT2 class: TRT: The 24 hours of Le Mans is a haughty adversaries it gives and takes as I am sure you have found out there. You won in your first trip the storied track and then this year as you closed out the CR.6 history at the track with a near perfect race. Can you reflect on the nine years that you have competed at Circuit de La Sarthe -- the wins, the near wins, and what racing there means to you. Johnny O: I first raced Le Mans in 1994 with Nissan in the IMSA class they had and won. Since then I have been back every year since 1998. Winning there is the most important accomplishment any driver can achieve. Most drivers are just blessed to be in the race, and my memories there will always be amongst my best in racing. As the only American to have 4 wins there... I know it's something that I will always cherish and consider one of my greatest accomplishments.